Feast over a lavish spread of royal delicacies from the kitchens of Lucknow. Explore the marvelous monuments at Khajuraho. Drench yourself in the mystique of Varanasi, one of the oldest living city in the world. Treat your appetite with a lavish dinner on board. Wake up to a delicious on board Breakfast as you arrive at the Pink City, Jaipur. 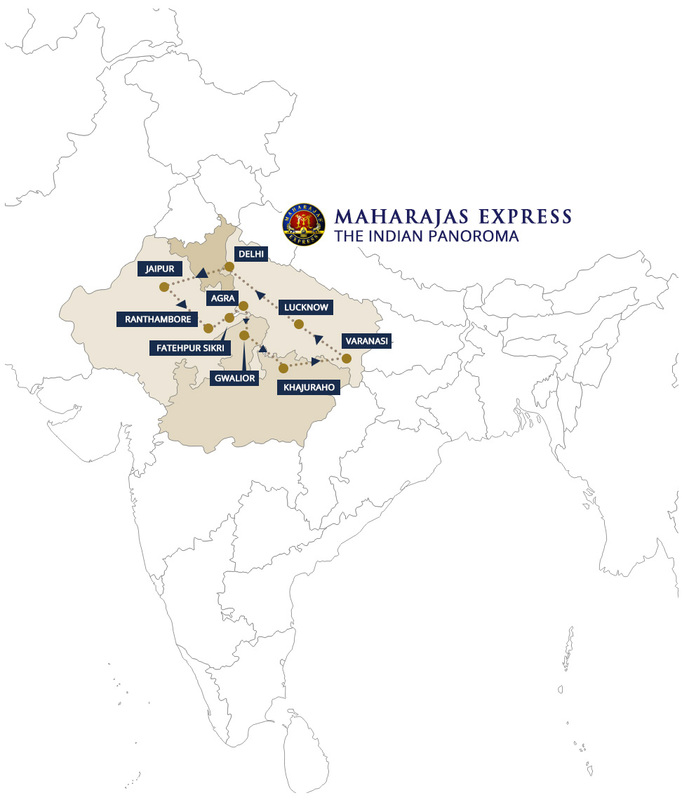 Maharajas' Express is a leader in cultural tourism and we ensure that our guests don't miss the cultural essence of our country. After visiting Amber Fort guests proceed to City Palace / Jai Mahal Palace for exclusive Elephant activities where guests may choose to decorate them with bright hues, feed them or take the regal ride followed by lunch. Guests can treat themselves to an on board Dinner. Maharajas' Express then leaves for the second place in its Indian luxury odyssey, Sawai Madhopur to bring you closer to the flora and fauna of India. Guests later return to the comforts of the Maharajas' Express for an on board dinner. Guests can enjoy an on board lunch and then proceed to visit to Gwalior Fort, Saas Bahu Temple and Jain cave sculptures or they can also choose to avail spa facilities at Usha Kiran Palace Hotel . Over the years we have created a niche for ourselves in Indian culture tourism and afterwards our guests can visit the Jai Vilas Palace Museum followed by Hi Tea in the compound of the palace. Enjoy delicious on board breakfast and lunch at our thematic restaurants - Rang Mahal and Mayur Mahal. Express continues its spiritual escapade. Guests please their taste buds with an on board breakfast. In Varanasi guests visit the Silk weaving center followed by a sumptuous lunch at Taj Gateway Hotel. Even in our Indian luxury odyssey we ensure that our guests do get to observe the divine side Indian culture, our guests enjoy a boat ride at the holy river Ganges to witness evening prayer. Guests then return to the comforts of the Maharajas' Express and have dinner on board. The Maharajas' Express leaves for the city of royal splendor and relishing delicacies, Lucknow. Guests spend their night comfortable on the opulent Maharajas' Express. Guests start their day with an on board breakfast. Guests proceed to visit Bara Imambara, Chota Imambara, Rumi Darwaza and The Residency followed by delicious Awadhi lunch along with the live Kathak Dance performance at Vivanta by Taj. We believe catering everything with extravagance in our Indian luxury odyssey. Guests later return to the comforts of Maharajas' Express and enjoy an "Indian Evening" followed by dinner on board. Then Maharajas' Express leaves for Delhi, marking the end of its Indian culture tour. Guests begin their day with an on board breakfast. Please contact your Guest Relations Executive for further details, prices and bookings of optional activities.